So here is the story. You go to a flea market and buy an assorted box of goodies for $50. You take the box home, have a closer look at it – and guess what you just purchased a Renoir. 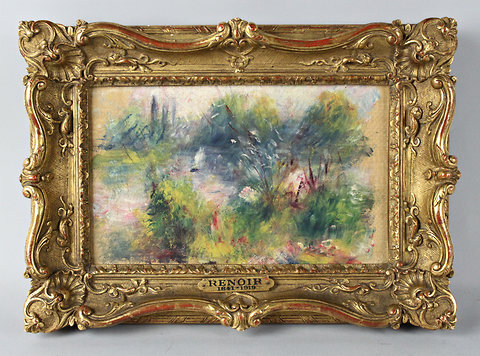 More specifically you have just purchased Paysage Bords De Seine a Renoir painting of the river Seine. This is not a new story by any means, generally every couple of years someone finds a priceless piece of art behind the couch/in the attic/on a market stall. What interests me about this is the expected selling price is $100,000. That’s right, a flea market to auction profit of $99,950. And yet nothing about the painting has changed. Its still the same age, still the same colours and still the same brush strokes. So the change in price is because of the fame of Renoir. This is slightly concerning for any up and coming artists out there. Yes, the quality of what you produce is important, but what is more important is your branding. Because most of your selling price is made from your ‘name’. So for any school leavers out there, forget going to (and paying for) art school for three years. Instead focus on getting Lady Gaga to talk about your work in Vogue. Because after all, it does not matter what you have painted, if you have a famous name you will be fine.